Defibrillation is a process in which an electronic device sends an electric shock to the heart to stop an extremely rapid, irregular heartbeat, and restore the normal heart rhythm. Defibrillation is performed to correct life-threatening fibrillations of the heart, which could result in cardiac arrest. It should be performed immediately after identifying that the patient is experiencing a cardiac emergency, has no pulse, and is unresponsive. Defibrillation should not be performed on a patient who has a pulse or is alert, as this could cause a lethal heart rhythm disturbance or cardiac arrest. The paddles used in the procedure should not be placed on a woman's breasts or over a pacemaker. Fibrillations cause the heart to stop pumping blood, leading to brain damage and/or cardiac arrest. About 10% of the ability to restart the heart is lost with every minute that the heart stays in fibrillation. Death can occur in minutes unless the normal heart rhythm is restored through defibrillation. Because immediate defibrillation is crucial to the patient's survival, the American Heart Association has called for the integration of defibrillation into an effective emergency cardiac care system. The system should include early access, early cardiopulmonary resuscitation, early defibrillation, and early advanced cardiac care. Defibrillators deliver a brief electric shock to the heart, which enables the heart's natural pacemaker to regain control and establish a normal heart rhythm. The defibrillator is an electronic device with electrocardiogram leads and paddles. During defibrillation, the paddles are placed on the patient's chest, caregivers stand back, and the electric shock is delivered. The patient's pulse and heart rhythm are continually monitored. Medications to treat possible causes of the abnormal heart rhythm may be administered. Defibrillation continues until the patient's condition stabilizes or the procedure is ordered to be discontinued. Early defibrillators, about the size and weight of a car battery, were used primarily in ambulances and hospitals. The American Heart Association now advocates public access defibrillation; this calls for placing automated external defibrillators (AEDS) in police vehicles, airplanes, and at public events, etc. The AEDS are smaller, lighter, less expensive, and easier to use than the early defibrillators. They are computerized to provide simple, verbal instructions to the operator and to make it impossible to deliver a shock to a patient whose heart is not fibrillating. The placement of AEDs is likely to expand to many public locations. After help is called for, cardiopulmonary resuscitation (CPR) is begun and continued until the caregivers arrive and set up the defibrillator. Electrocardiogram leads are attached to the patient's chest. Gel or paste is applied to the defibrillator paddles, or two gel pads are placed on the patient's chest. The caregivers verify lack of a pulse, and select a charge. After defibrillation, the patient's cardiac status, breathing, and vital signs are monitored until he or she is stable. Typically, this monitoring takes place after the patient has been removed to an intensive care or cardiac care unit in a hospital. An electrocardiogram and chest x ray are taken. The patient's skin is cleansed to remove gel or paste, and, if necessary, ointment is applied to burns. An intravenous line provides additional medication, as needed. Skin burns from the defibrillator paddles are the most common complication of defibrillation. Other risks include injury to the heart muscle, abnormal heart rhythms, and blood clots. American Heart Association. 7320 Greenville Ave. Dallas, TX 75231. (214) 373-6300. http://www.americanheart.org. Cardiac arrest — A condition in which the heart stops functioning. Fibrillation can lead to cardiac arrest if not corrected quickly. Fibrillation — Very rapid contractions or twitching of small muscle fibers in the heart. Pacemaker — A surgically implanted electronic device that sends out electrical impulses to regulate a slow or erratic heartbeat. termination of atrial or ventricular fibrillation, usually by electric shock. Defibrillation by precordial shock is accomplished by delivering a nonsynchronized direct current to the myocardium. It is an emergency procedure, used to terminate a life-threatening ventricular arrhythmia. The electric shock is delivered either by placing metal paddles on the chest (closed defibrillation) or by applying paddles directly to the heart muscle, as in cardiac surgery. The high-voltage electrical current delivered during precordial shock causes complete depolarization of the heart muscle, disrupting all of the electrical circuits that are activating the heart muscle and causing ventricular fibrillation. This allows the heart's natural pacemaker to regain control and regulation of the heart rate and rhythm. The procedure carries some risk and should be done only by specially trained physicians, nurses, and paramedics. Cardiopulmonary resuscitation and the administration of intravenous fluids and drugs are essential components of defibrillation. Sodium bicarbonate is given to combat acidosis; lidocaine or amiodarone is given to forestall arrhythmias that may develop during and after defibrillation. Electrocardiographic readings and assessment of ECG patterns are done prior to the procedure to verify the presence of a lethal arrhythmia, and afterwards to evaluate the effectiveness of the treatment. Some ECG machines and cardiac monitors can continue to function during defibrillation because they have been designed to withstand the electrical shock when it is delivered to the patient. Burns of the skin may occur under the paddles at the time of defibrillation; steroid or lanolin-based ointments or creams are usually prescribed as treatment. The use of conduction gel and close contact of paddles to skin may prevent burns. More serious complications of defibrillation include cardiac arrest, respiratory arrest, neurologic impairment, pulmonary edema, and pulmonary and systemic emboli. The patient must be monitored carefully after the procedure for return of ventricular fibrillation. Additional observations include changes in blood pressure; pulse rate, rhythm, and character; state of consciousness; and adequacy of ventilation. Defibrillation: A, Anterolateral paddle placement for external countershock. External paddles are placed at the second right intercostal space and at the anterior axillary line in the fifth left intercostal space. B, Ventricular fibrillation converted to normal sinus rhythm with external countershock. From Polaski and Tatro, 1996. The arrest of fibrillation of the cardiac muscle (atrial or ventricular) with restoration of the normal rhythm, if successful. /de·fib·ril·la·tion/ (de-fib″rĭ-la´shun) termination of atrial or ventricular fibrillation, usually by electroshock. the termination of ventricular fibrillation or pulseless ventricular tachycardia (inefficient, asynchronous contraction) by delivery of an electric shock to the patient's precordium. It is a common emergency measure generally performed by a physician or specially trained nurse or paramedic. 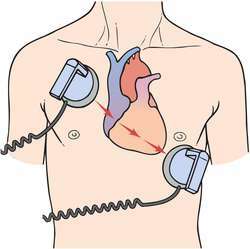 Defibrillation may be accomplished with defibrillator or special defibrillator pads. In external defibrillation, one paddle is placed to the right of the upper sternum below the clavicle, and the other is applied to the midaxillary line of the left lower rib cage. In internal defibrillation, which may be performed during open-heart surgery, the paddles are placed directly on the heart. The defibrillator, usually a condenser-discharge system, is set to deliver between 200 and 360 J. If shocks fail to restore a perfusion rhythm, cardiopulmonary resuscitation is begun. Repeat shocks also are attempted periodically until ventricular fibrillation ceases. defibrillate, v.
Cardiac pacing The termination of unsynchronized quivering of the ventricular myocardium by discharging a high energy, asynchronous electrical stimulus to the myocardium; the defibrillatory discharge often restores normal rhythm. See Low-energy defibrillation. 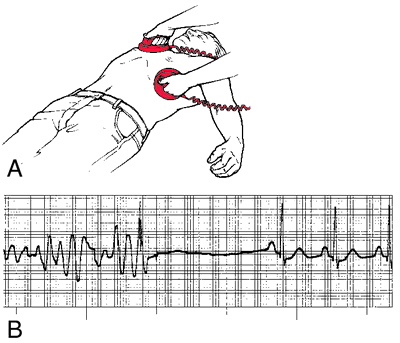 The arrest of fibrillation of the cardiac muscle (atrial or ventricular) with restoration of the normal rhythm. The restoration of the normal beat rhythm in a heart which is in a state of rapid, ineffectual twitching-one kind of CARDIAC ARREST. A strong pulse of electric energy (about 300 joules) is passed across the heart from two metal electrodes pressed to the chest. the application of a direct current (DC) electric shock to arrest ventricular fibrillation of the heart and restore normal cardiac rhythm. n the arrest of fibrillation, usually that of the cardiac ventricles. An intense alternating current is briefly passed through the heart muscle, throwing it into a refractory state. 1. termination of atrial or ventricular fibrillation, usually by electric shock. 2. separation of tissue fibers by blunt dissection. Defibrillation by precordial shock is accomplished by delivering a nonsynchronized direct current to the myocardium. It is an emergency procedure, used to terminate a life-threatening ventricular arrhythmia. The electric shock is delivered by means of metal paddles applied directly to the heart muscle, as in cardiac surgery, or by placing the paddles on the chest (closed defibrillation). where electrical equipment is not available for defibrillation, some combinations of drugs have been used. These include potassium chloride followed by calcium chloride or potassium chloride and acetylcholine. Q. Does anyone know if its possible to get breast implants if i have an implanted defibrillator? I have hypertrophic cardiomyopathy. I'm 27 and in great health, I workout 6 days a week and I have no further symptoms. A. Thanks for your help. In fact I have an appointment with my cardiologist in a couple of weeks and if he says its OOK I will definitely consult it with the plastic surgeon as well. However I always try to do some additional research on my own and get second opinions.